The information below was first presented as a poster at the 2014 North Americal Paleontological Conference (NAPC). Cincinnati has a strong tradition of paleontology. Its local rocks, with their incredible abundance of well-preserved Late Ordovician fossils, are known worldwide. So too are its fossil collectors, who have scoured the region’s hillside quarries, stream banks, and roadcuts since the mid-19th century. Some early collectors chose to share their finds with the broader scientific community, publishing their observations in the Journal of the Cincinnati Society of Natural History and other, mostly local, publications. These first generations of publishing amateurs have become known as the “Cincinnati School of Paleontology” and some gained national recognition in their day. Their ranks include Uriah P. James, Samuel A. Miller, Charles Schuchert, Ray S. Bassler, and Edward O. Ulrich. See A Sea Without Fish (Meyer and Davis 2009) for more on the “Cincinnati School”. 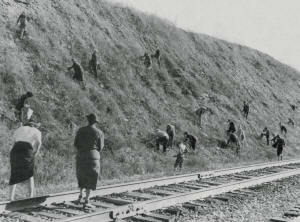 These workers collected hundreds of thousands, if not millions, of specimens, many of which are now housed in the United States National Museum, the Cincinnati Museum of Natural History, the Field Museum of Natural History, and other institutions. Their descriptive work provides the basis for the majority of taxa known from Cincinnatian strata and set a high standard for future amateurs. conducted as a part of the University of Cincinnati natural history lecture series. These collectors are the direct predecessors of the Dry Dredgers. An evening lecture-discussion series hosted by the University of Cincinnati in the late 1930s and early 1940s renewed public interest in Cincinnatian fossils. Natural history was the primary topic and professors would lead weekend excursions to nearby sites of geological interest, where fossil collecting proved to be extremely popular. As the lectures tapered off in the 1940s, a group of the most dedicated fossil hunters decided to form a permanent association dedicated to amateur paleontology. They easily persuaded one of the lecture series’ geology professors, Kenneth Caster, to be their faculty advisor and the Dry Dredgers were officially established in April 1942. 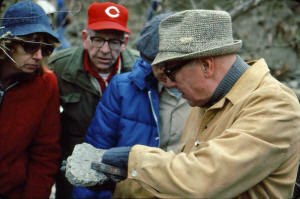 Close professional involvement became a hallmark of the organization, which has enjoyed strong ties to the University of Cincinnati (Kenneth Caster, Elizabeth Dalvé, Richard Davis, David Meyer, Carlton Brett, Paul Potter), Miami University (John Pope), and the Cincinnati Museum of Natural History (Richard Davis, Greg McDonald, Nigel Hughes, Colin Sumrall, Paula Work, Brenda Hunda, Glenn Storrs). 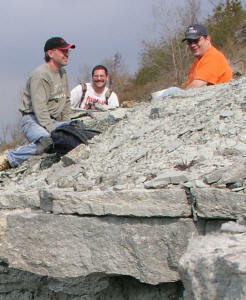 FIGURE 2: Faculty advisors of the Dry Dredgers (left to right): Kenneth Caster, Richard Davis, and David Meyer. Richmondian age trilobite “butter shale” in southeastern Indiana. The Dry Dredgers have been in continuous operation since 1942, making it one of the oldest amateur paleontology clubs in the United States, if not the oldest. The group has a substantial membership (roughly 250 as of 2013), with a strong core of regular meeting attendees and club officers. From its inception, the group has met for monthly meetings on the campus of the University of Cincinnati. Each meeting features a keynote lecture, typically presented by a professor or graduate student, and a social segment, where members can share their latest finds and discuss paleontology. Meetings also include a beginners’ class, where younger and newer members can learn the basics of fossil collecting and paleontology. Weekend field trips are traditionally held the Saturday following the meeting. 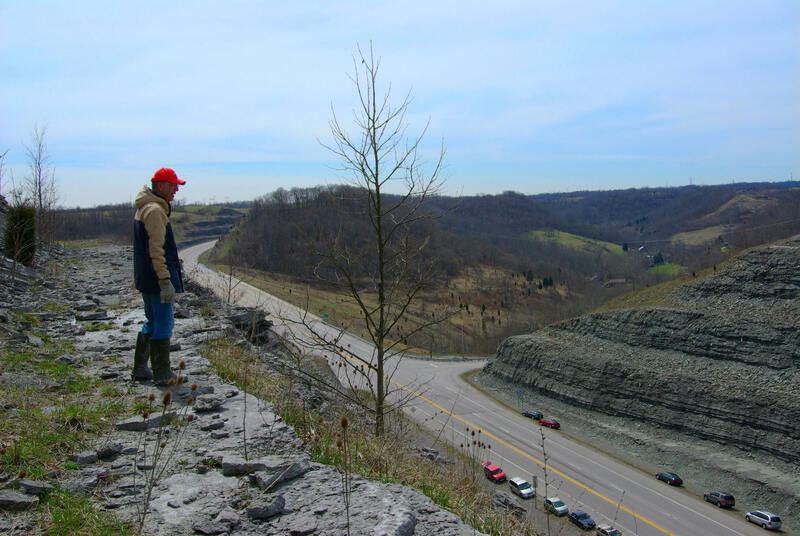 Local roadcuts, particularly those within an hour’s driving time of Cincinnati, are the most frequent destinations, but trips have also visited quarries, museums, and parks. Annual multi-day field trips visit more distant localities in New York, Canada, or North Carolina. FIGURE 5: A few of the many museum-quality specimens found by the Dry Dredgers. A) Cincinnaticrinus varibrachialus. 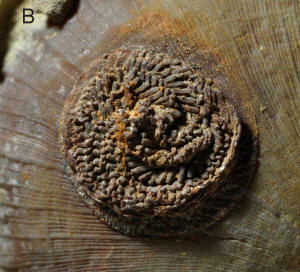 B) Plicodendrocrinus casei. C) Cupulocrinus polydactylus. D) Flexicalymene retrorsa. The Dry Dredgers’ website (www.drydredgers.org) hosts field trip photo galleries, specimen pictures, fossil identification keys, and useful paleontology links. 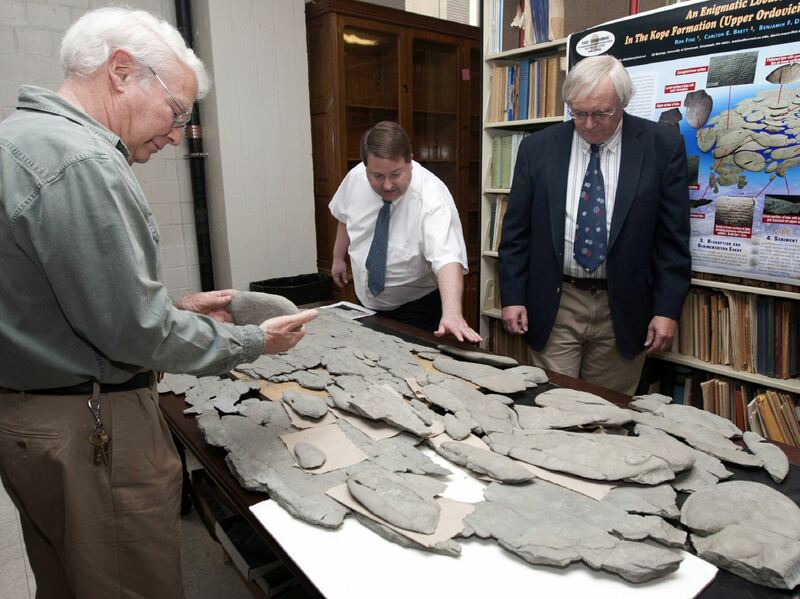 Steadily growing in content since 1995, the website is a top-ranked search result for Cincinnatian fossils, and a perennial source of new membership. 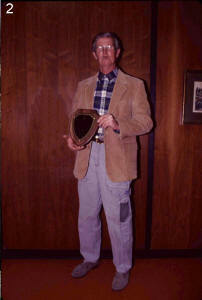 Paleontological Research Institution in 1996 and the Strimple Award in 2001. The Dry Dredgers promote paleontology both as a hobby and a science. The thrill of finding a great specimen is often the hook that draws newcomers to collect fossils, but science is at the core of the organization. The group’s officers and faculty advisors consistently encourage good collection management practices, such as proper locality documentation, literature-based taxonomic identification, knowledge of stratigraphy, and awareness of current research trends. Retrorsirostra carleyi is indicative of the Arnheim Formation. including R. carleyi, are available on the Dry Dredgers website. Dry Dredger meetings give professionals a chance to engage with the public and disseminate their research. While vertebrate paleontology, particularly dinosaur paleontology, is undoubtedly the public face of the field, the Dry Dredgers provide exposure for many other aspects that largely remain unappreciated by the lay public, including paleoecology, micropaleontology, and stratigraphy. The Dry Dredgers conduct extensive public outreach outside of meetings. The Dry Dredgers and Cincinnati Mineral Society cohost GeoFair, an annual fossil, gem, and mineral show held in Cincinnati. The exposition features educational displays and lectures by professional geologists, as well as a popular fossil identification booth. The Dry Dredgers have hosted similar educational tables at Cincinnati Nature Center, the Cincinnati Museum, and various local events. 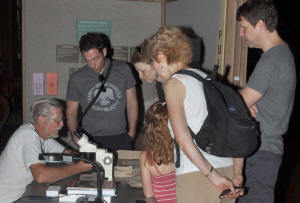 FIGURE 8: Stephen Felton hosts a fossil ID table at the Cincinnati Nature Center. horn coral, not a dinosaur tooth, such events are great for promoting the science. In 2002, the Dry Dredgers helped the Cincinnati Museum coordinate a vote for the official city fossil of Cincinnati. The edrioasteroid Isorophus cincinnatiensis emerged victorious, making Cincinnati one of the few cities to have a city fossil. 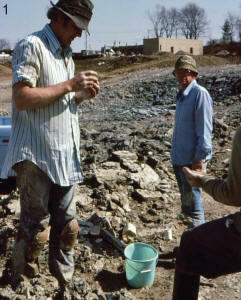 The Dry Dredgers played a leading role in the establishment of Trammel Fossil Park in Sharonville, Ohio. University of Cincinnati professor David Meyer and Dry Dredgers Stephen Felton and Jack Kallmeyer worked with the R. L. Trammel family to secure the land rights and preserve this scientifically significant locality. The park features educational signage, a large outcrop exposing multiple formations, and public fossil collecting year-round. The Dry Dredgers demonstrate that interaction between avocational and career paleontologists benefits both parties. Amateurs often come across new exposures and alert professionals when they encounter something unusual or significant. 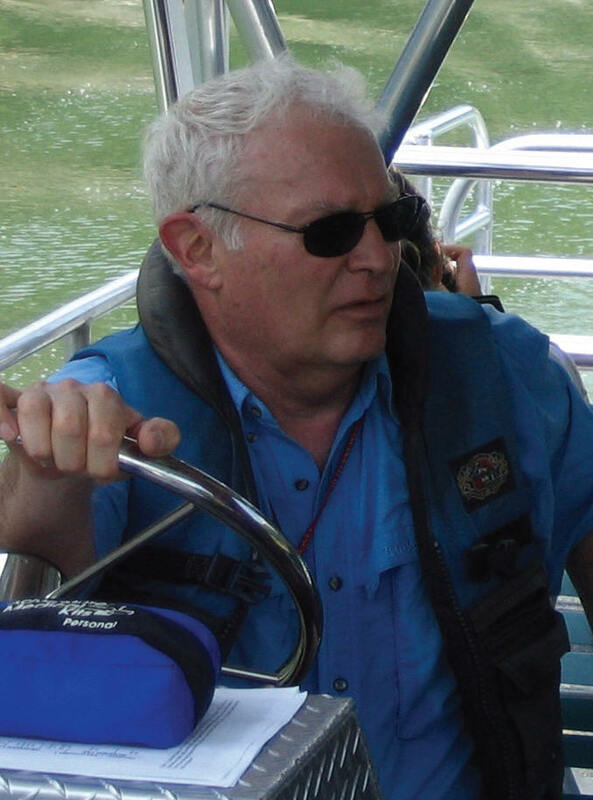 Dry Dredgers have helped graduate students gain access to stratigraphically and paleontologically significant quarries, and have permitted the use of private collecting sites for scientific use, as in the case of Dan Cooper’s Mt. Orab trilobite locality (Hunda et al. 2006). Dry Dredgers members have donated individual specimens, partial collections, or entire collections to Miami University, the University of Cincinnati, the Cincinnati Museum Center, the Paleontological Research Institution, and other museums and universities. Jack Kallmeyer recently donated a substantial collection of Cincinnatian fossils to the Stigall Lab at Ohio University, forming the basis of the Digital Atlas of Ordovician Life (www.ordovicianatlas.org; Brame et al. 2013). Rousseau Flower’s review of Cincinnatian cephalopods (Flower 1946). The redescription of the Cincinnatian eurypterid Megalograptus (Caster and Kjellesvig-Waering 1964). Stephen Felton has published on the interrelated paleoecology of cornulitids, gastropods, and crinoids (Morris and Felton 1993). Jack Kallmeyer has worked with Stephen Donovan (Naturalis Biodiversity Center) on the functional morphology of several Cincinnatian crinoid stems (Donovan et al. 1995), as well as on the description of a new species of cincinnaticrinid, Tenuicrinus longibasalis (Kallmeyer and Donovan 1998). Dan Cooper worked with Nigel Hughes to describe an unusual cluster of Flexicalymene granulosa trilobites (Hughes and Cooper 1999). The description of the glyptocystitioid rhombiferan Cheirocystis fultonensis (Sumrall and Schumacher 2002). William Heimbrock, Stephen Felton, Dan Cooper, Walter (Bruce) Gibson and Debbie Scheid together contributed hundreds of Flexicalymene trilobites for an epibiont study by Marcus Key, Gregory Schumacher, Loren Babcock, and Robert Frey, and were co-authors of the resulting paper (Key et al. 2010). 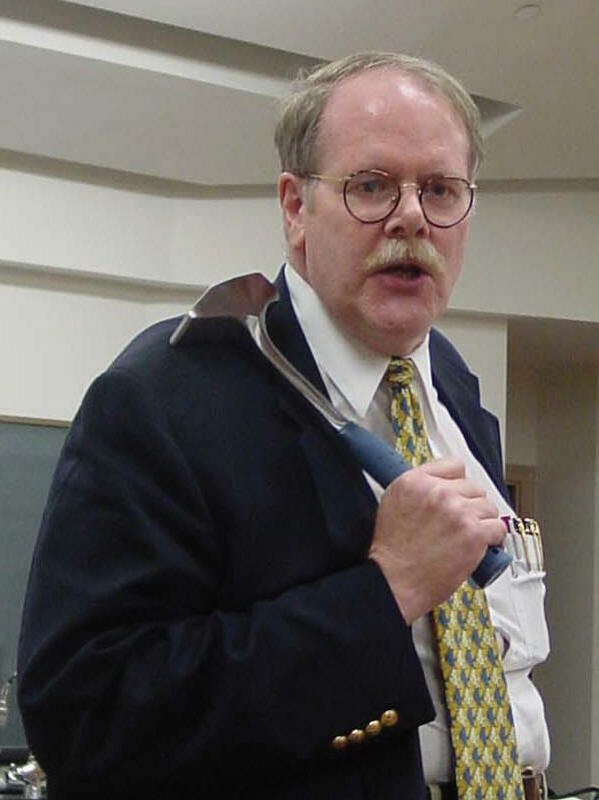 William Heimbrock has perused research of phosphatic zones within the Cincinnatian, colloquially known as “Cyclora hash” for their unique fauna. He has worked with Michael Vendrasco (University of Granada) to study possible preservation of fossil nacre in these layers (Vendrasco et al. 2013). Thomas Bantel and Don Bissett have provided specimens and assistance to Carlton Brett and James Thomka (University of Cincinnati) in their study of diploporite echinoderm holdfasts and taphonomy (Thomka et al. 2013, Thomka and Brett 2014). 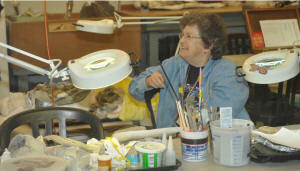 the Cincinnati Museum Center’s fossil preparation lab. curators in the museum’s extensive invertebrate paleontology collections. The Dry Dredgers have made many contributions to edrioasteroid research. 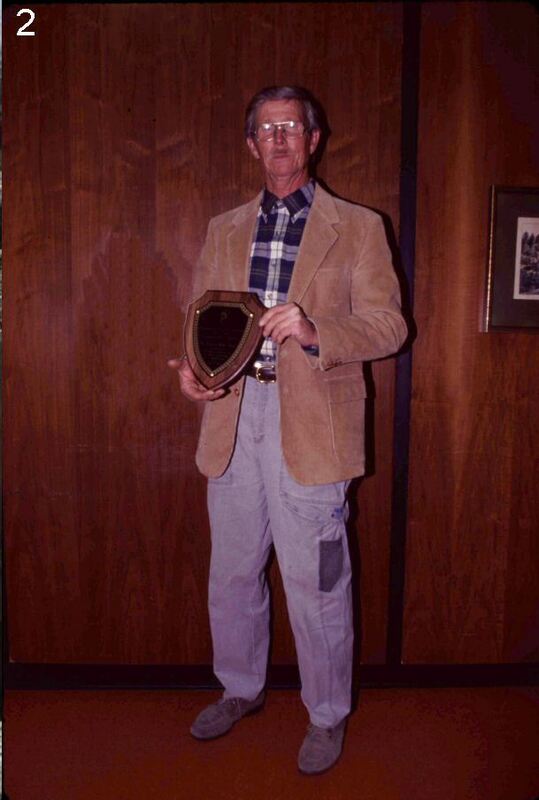 William White provided specimens and locality expertise for Bruce Bell’s monograph on North American edrioasteroids (Bell 1976). Most recently, Dry Dredgers participated in the discovery and excavation of multiple edrioasteroid pavements in Ohio and Kentucky, leading to a spat of publications (Meyer 1990; Sumrall et al. 1999; Meyer et al. 2008; Sumrall 2010, Shroat-Lewis et al. 2011). Finally, the Dry Dredgers provide direct financial support for basic research, through the annual Dry Dredgers Paleontological Research Award. Amateurs, students, or professionals may submit research proposals to the Dry Dredgers. A committee then evaluates the applications and selects the winners. Special attention is given to projects involving the Ordovician and/or Cincinnati region. 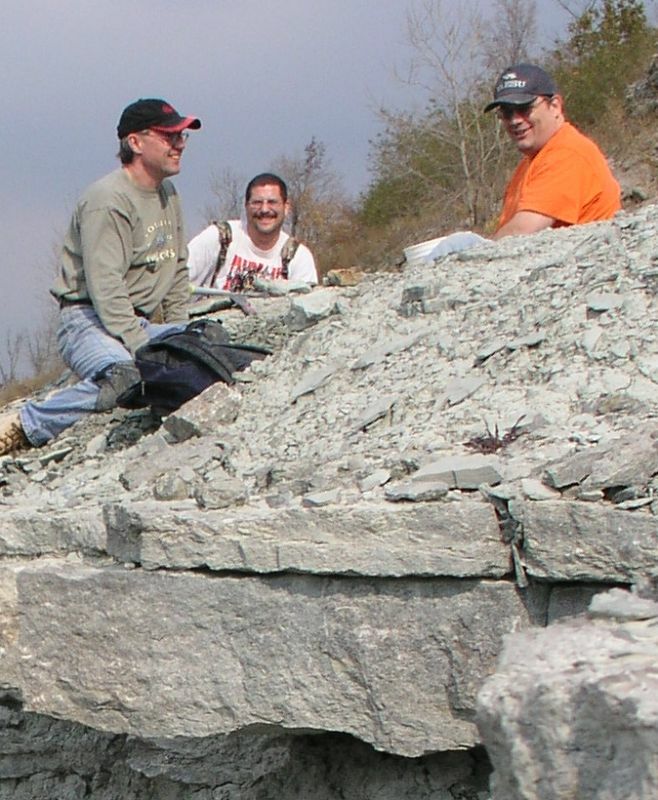 This is in addition to an annual donation to the University of Cincinnati Caster Fund, which provides support for graduate research in geology. Also, in 2013, the Dry Dredgers provided substantial funding to help restore an Ordovician exhibit at the Cincinnati Museum Center. 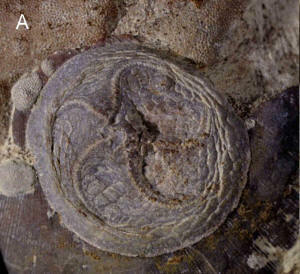 FIGURE 10: The Dry Dredgers have aided echinoderm research involving: A) the edrioasteroid Isorophus cincinnatiensis (Cincinnati’s official city fossil); B) the edrioasteroid Streptaster vorticellatus; C) the rhombiferan Cheirocystis fultonensis. Ron Fine is the discoverer of the problematic lobate mat-like organism nicknamed “Godzillus”. This unique specimen is currently believed to be an algal or microbial mat, but Fine, along with David Meyer, Carlton Brett, and Ben Dattillo, continue to search for a conclusive identification. Fine is also investigating several unusual mollusk-rich horizons within the Kope Formation. Though the Kope represents a deep-water, offshore depositional environment, these layers contain an incongruous shallow-water fauna, including algae, colonial corals, and Hebertella sp. brachiopods. America meetings (Fine et al. 2012, Meyer et al. 2013). William Heimbrock is collaborating with Ben Dattilo (Indiana University – Purdue University Fort Wayne) and Rebecca Freeman (University of Kentucky) on a study of the taphonomy of the Cincinnatian’s phosphatic layers, as well as ongoing work with Michael Vendrasco regarding fossil nacre. Steve Felton continues to work on Cincinnatian gastropods, a longtime passion. He has accumulated evidence that some local gastropods traditionally identified as Cyclonema or Holopea may in fact belong to the genus Naticonema. Jack Kallmeyer has collected specimens of an undescribed camerate crinoid from the Kope Formation (Southgate Member). He is also investigating the rare and understudied problematicum “Conchopeltis” miseneri Foerste 1917. Kyle Hartshorn is working on the echinoderm fauna of the Lower Silurian Brassfield Formation, including undescribed crinoids and a rhenopyrgid edrioasteroid. He also plans a redescription of Eobalanus Ruedemann 1925, from the Ordovician of New York. 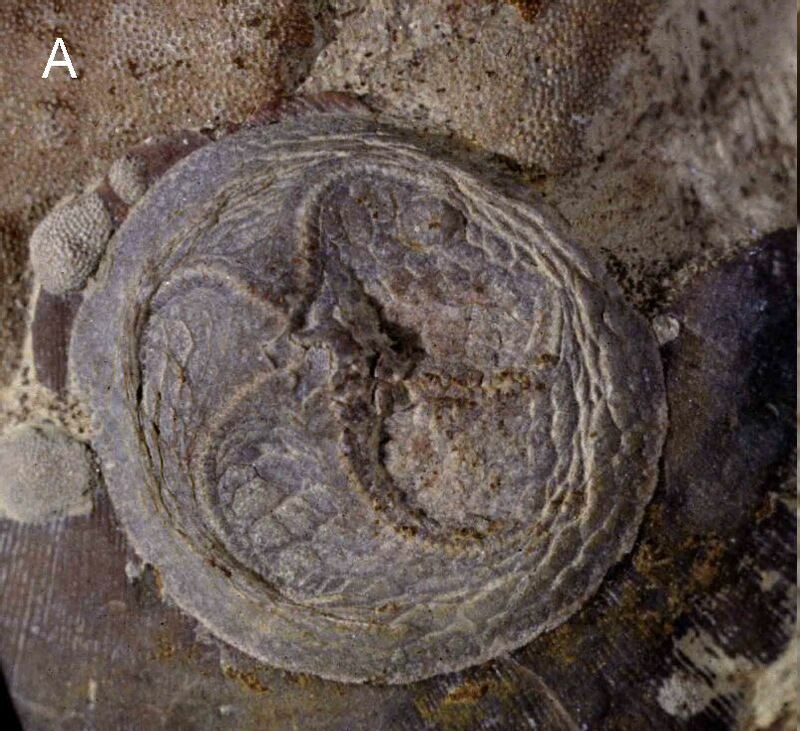 Mistakenly identified as a barnacle, Eobalanus may be the oldest known multiplacophoran, an order of stem-group chitons.